If You Want An Update On The New Sam Roberts Band Album . 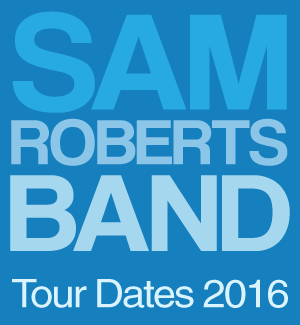 . .
Good news if you’re not-so-patiently waiting to hear new music from the Sam Roberts Band. This is not a fantasy, lo or otherwise. This is straight from Sam himself – I’m just repeating what he told Jack FM’s Rick Lee in this interview about the SRB’s free show at Sun Peaks on July 8th. It’s a good interview. If you didn’t get the chance to listen yet, here are some of the things Sam and Rick talked about . . .
Sam is listening to the master of the new record before it’s forever and ever. This single will be the first song the SRB “pull out of the bag” and play live. We’ll hear the rest of the record live when the SRB tour starts this fall. Tl;dr: NEW SINGLE, NEW RECORD, AND NEW TOUR? Yes, yes, and yes! There’s a longer version of the interview right here. It covers other important stuff, like Father’s Day and Game of Thrones and a gender-neutral Canadian anthem. And that free Sun Peaks show? There’s more info here, and you can buy Front of Stage Access tickets – if you’re into that kinda thing – here, too. This entry was posted in news on June 21, 2016 by annie.